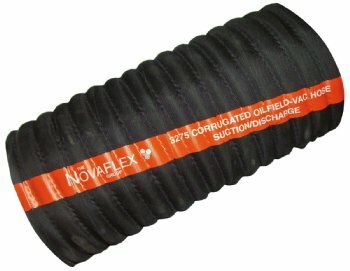 Novaflex® 3275 is a rugged suction and discharge, flexible hose designed for oilfield vacuum truck and oilfield fracturing applications. This hose is ideal where applications require a hose designed for the transfer of salt & fresh water, tank bottoms, drilling mud, combined with dilute solutions of crude oil. Not recommended for use with refined petroleum products such as gasoline. Not for use with BioFuels. Not recommended for refined petroleum products such as gasoline!